Most individuals directly involved in the push for the re-listing of the Northern Rocky Wolves are involved in environmental groups such as Defenders of Wildlife, Sierra Club, and Conservation Northwest among many others. Below are examples of how such organizations convey their side of the controversy to various social worlds through a variety of media/communicative outlets. Defenders of Wildlife. Detailed updates on the groups ongoing fight to conserve wolves are updated regularly to thier main site. Features include a blog dedicated to the project, court documents regarding lawsuits (see below) and complaints filed by the organization, and general fact sheets. One of the many ways that organizations such as the Defenders of Wildlife get the word out about thier cause is through social networking sites such as Facebook. Updates on the organization's fight to conserve wolves are posted to their main page on a regular basis. In an influential court decision, an attempt at a temporary injunction to the start of the first wolf hunting season was denied. While this decision was a hit to conservation in general it opened up other avenues of pursuit. Celebrity Ashley Judd calls for the public to encourage/pressure the Obama Administration to reverse it's decision to keep and enact the Bush era call to take the Northern Rocky Wolf off of the endangered species list. This reversal would effectively halt the progression of any further legal hunting of wolves. Local man Bob Goldman gets involved in raising awareness about Cabela's sponsorship of Idaho's Predator Derby by leading a protest outside of their Main store. Local Wyoming editorial regarding one of the current anti-wolf claims. 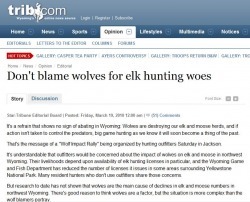 Here the author tries to dispel the notion that wolves are the reason for possible elk population declines. Note: the discussion reveals just how heated this debate can be. Blog post on a western news site rebuking popular anti-wolf claims and actions. Again, interesting back and forth postings in the comments section. 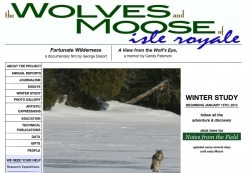 Cited as proof of the instability of wolf populations as a whole, the Isle Royale, MI studies have been conducted since 1958 on a protected island inhabited by a population of wolves and moose. These studies have shown that wolves may not follow the typical predator prey interactions (Lotka-Volterra models) resulting in a perhaps natural instability in population. Links to all technical publications and annual reports. Highlighting the majority of the concerns over wolf hunting, such as a loss of genetic connectivity and selective population delisting the authors conduct a meta analysis on the controversy concluding that the population is not ready to be delisted. In a comparison study between future ecological impacts to Yellowstone after wolf introduction and that of Isle Royale, Smith et. al. (2003) explore complex trophic interactions between prey species, other carnivores, and wolves. This study posits that it could take decades for the full ecosystem response to unfold and stabilize.